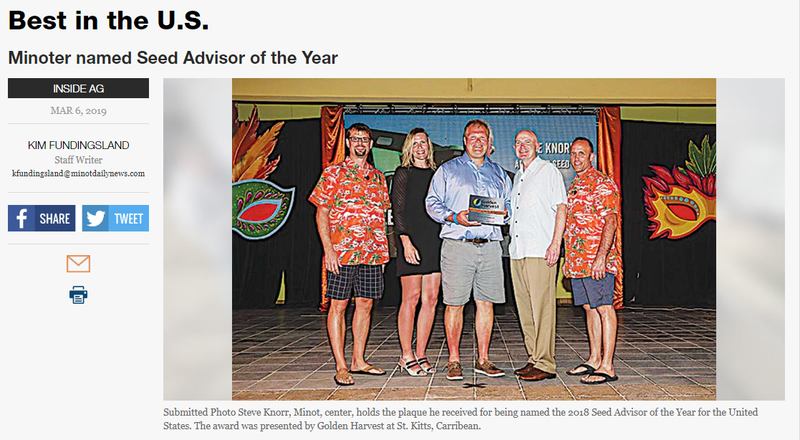 March 18, 2019 – Steve Knorr, center, is awarded the 2018 Golden Harvest National Seed Advisor of the Year in St. Kitts based on excellence in business performance, dealership growth and customer support. Source: Kim Fundingsland – Staff Writer – Minot Daily News in Minot, ND. http://www.minotdailynews.com/special-sections/inside-ag/2019/03/best-in-the-u-s/ Minot Daily News provides the daily newspaper for Ward County, covering local, regional and national news, delivering throughout North Dakota and all 50 states. Learn more at http://www.minotdailynews.com/.